With the cold weather on its way out and the beautiful spring weather coming in, it’s the perfect time to get outdoors and enjoy it. Take the whole family outdoors and let the kids run around and plan while you sit back and soak in the sun rays and enjoy the scent of the blooming spring flowers. It’s also a great time to update your outdated patio set or get one if you don’t have one. And Pier 1 is the perfect place to find just what you’re looking for. Pier 1 has an enormous collection of outdoor furniture that actually also looks great indoors. I love it when an outdoor area looks like an extension of your home with outdoor area rugs, pillows and comfortably padded chairs and lounges. This is exactly how my patio looks. 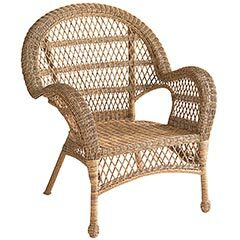 I purchased beautiful rattan chairs with decorative cushions that coordinate with my house color. I have blue area rugs located in the outdoor sitting area and under the patio table. Adding this beautiful indoor/outdoor furnishings creates an environment that is warm, comfortable and inviting. Here are just a few of the items I got from Pier 1 to decorate my outdoor area and get ready for spring. Additionally, if you don’t the budget for new furniture, you can grab some accessories like cushions and pillows and add a pop of color and really brighten the area. The pillow seen here is only $20 at Pier 1′s online store. Another great piece of furniture that goes great indoor and outdoor in Pier 1′s famous papasan. There is nothing better than nuzzling down in this big comfy chair. It’s perfect for a quick cat nap as long as you get the cat or dog out of it. Also for interested Pier 1 is partnering up with Izea and hosting a Pier 1 Tweetups. These Tweetups will be held throughout the United States a few major cities. These cities include Dallas, Orlando, Atlanta and New York City. If you’re located in one of these areas, make plans to go visit, and meet some of your area’s bloggers & Tweeters.